Tag Archives: Future Music Festival. Timmy Trumpet has released a video with co-operation of Police Super-intendant and festival venues warning all festival goers that there will be a large sniffer dog operation present at the upcoming Future Music festival. This entry was posted in Blogs, DJs, Festivals, Upcoming events and tagged Future Music Festival., music festival, no drugs, police, sydney, Timmy Trumpet on February 27, 2013 by bppdjcentral. 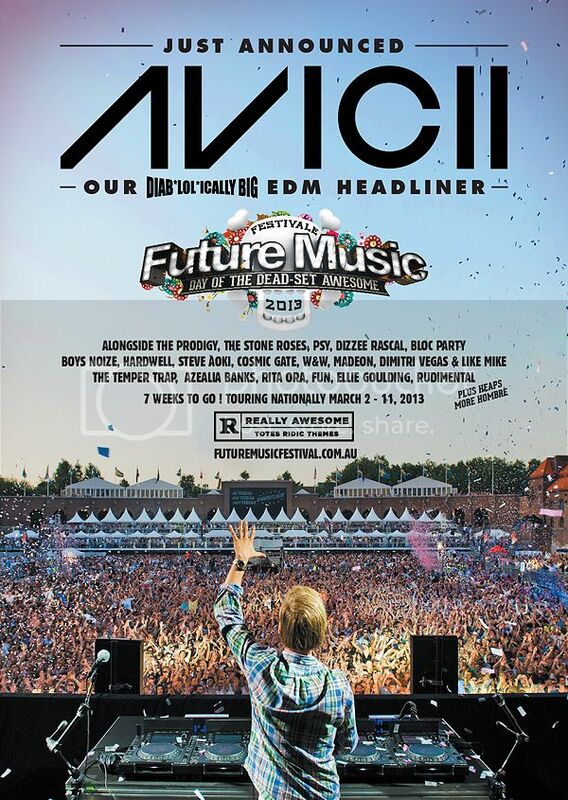 Future Music is all set to kick off its 2013 party this weekend! With a line up that includes The Untouchables, The Prodigy, Psy, Avicii, Hardwell, Rudimental and ssooo much more you are absolutely spewing if you don’t have your tickets yet! Sporting a “Day Of The Dead Set Awesome” theme and a whole lot of craziness grab your Saturday the 9th of March by the Cahoona’s and get those passes from Future Music Festival and for those who are already going, well set lists and times are our finally out, so begin planning my pretties!!! This entry was posted in Blogs, DJs, Festivals, HOT!, Music, NEW!, Upcoming events and tagged Avicci, electro, Future Music Festival., hardwell, House Music, psy, rudimental, sydney, The Prodigy on February 27, 2013 by bppdjcentral. Kill The Noise Take Out MTV Clubland’s Video Pick Of The Year! MTV Clubland had fans vote for their favourite electronic dance music video from 2012 and Jake Stanczak aka Kill The Noise took out this title last week for his Kill The Noise Part 1 clip. Stanczak thought Kill The Noise had zero chance a against the other big name artists such as Diplo, Alesso, Cazzette and Steve Aoki. However, it’s easy to see how this video directed by Mike Diva won. It is set in the year 2054, after an apocalyptic virus called ‘the noise’ has taken over and survivors must battle against the infected and their overlord. The video features a tonne of special effects, makeup and costumes to bring these infected zombies to life and convey the story. 2013 is set to be an even bigger year for Kill The Noise, with work having already begun on the Kill The Noise Part 2 video alongside animator Lee Hardcastle. Kill The Noise will also have a heavy touring schedule for next year, kicking off with the Holy Ship festival on Janurary 4 before heading to Peru January 7 and then down under to Australia to tour with Future Music festival in March. This entry was posted in Awards, DJs, Music, NEW! and tagged Alesso, Apocalypse, Cazzette, diplo, Future Music Festival., Holy Ship, Jake Stanczak, Kill The Noise, Mike Diva, mtv, MTV Clubland, music video, steve aoki, video, Zombies on December 17, 2012 by bppdjcentral.